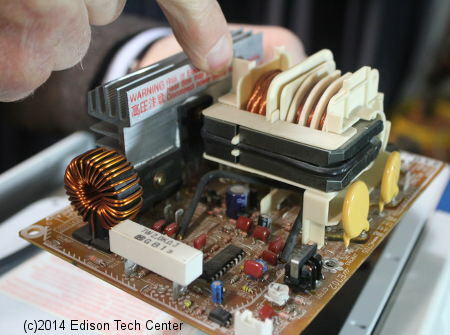 When the Edison Tech Center published its video with Rudy Dehn talking about how the device worked hundreds of thousands chose to watch it, however many didn’t get the full story. Yes Rudy was one of the guys who made this staple of modern kitchens available, but similarly to most other inventions it took many others to build a foundation. Notable contributors include Albert W. Hull, Kunio Yagi, C.W. 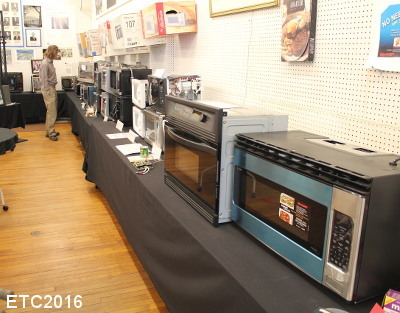 Rice, Percy Spencer, and others who all contributed a bit to make the modern oven possible. 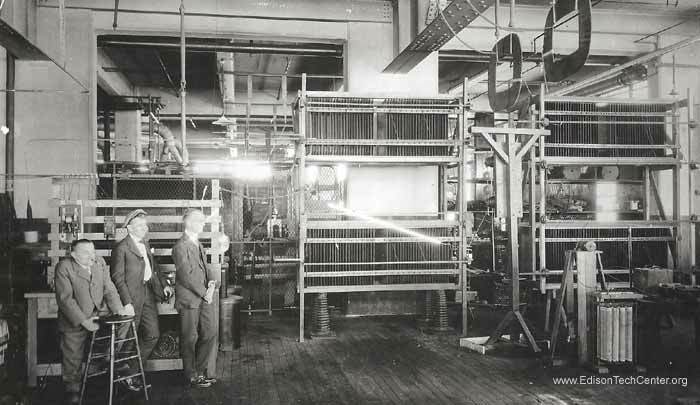 1928 Kunio Yagi works on multi-anode oscillators in Japan. 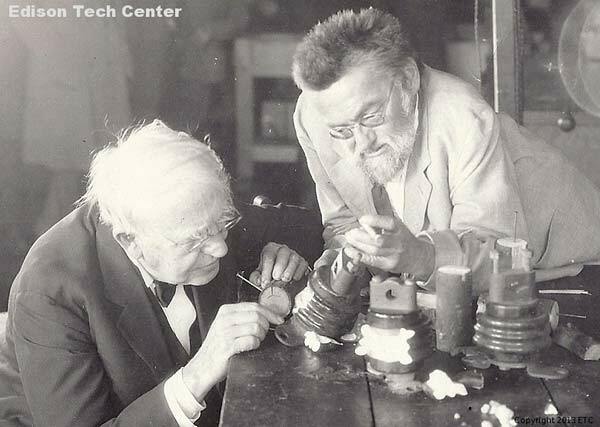 The same year C. W. Rice demonstrates a magnetron transmitter at GE in Schenectady. 1945 Percy Spensor at Raytheon proposes a microwave oven as a peacetime spin-off of radar. The Radarange is sold to commercial and institutional users. 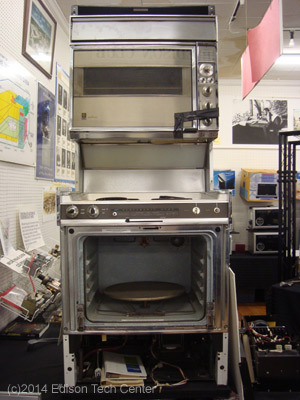 1950-1953 GE Range Department developed full size oven using 915 MHz. 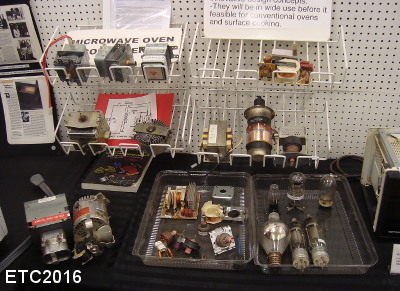 1960s GE engineers continue to work on making the power supplies smaller for the microwave oven (as well as many other applications). 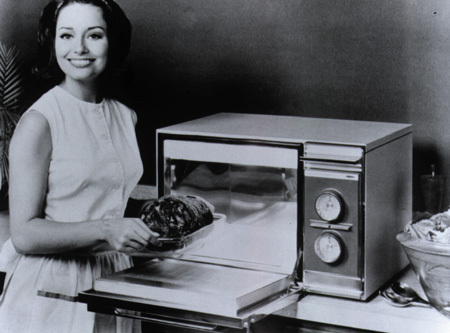 GE engineers including Rudy Dehn work on making the microwave oven smaller so it can be the modern countertop device we know today. 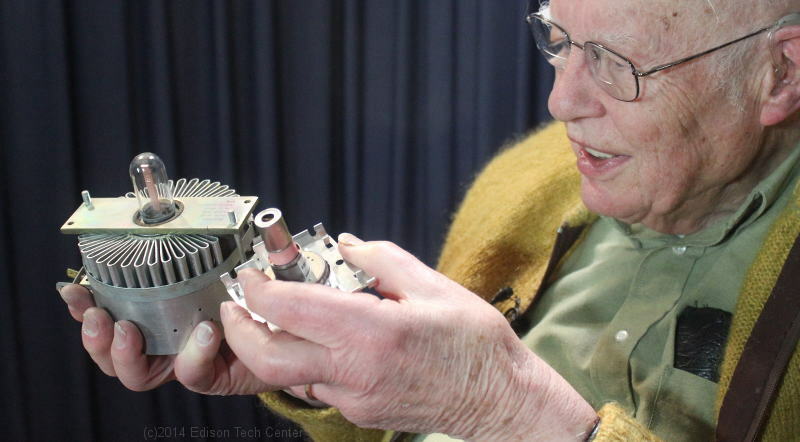 Rudy Dehn holds two generations of magnetrons at the Edison Tech Center. The large device on the left is from the 1950s full sized oven. The device on the right is the compact version used in most today. 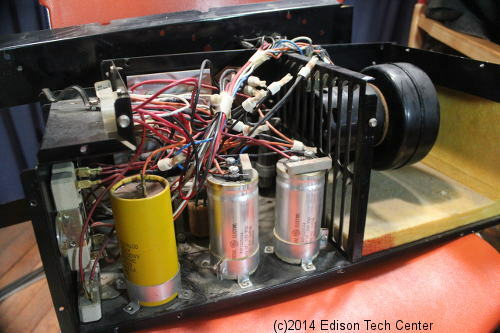 This beast of capacitors and tubes was just the power supply for the 1960s era microwave ovens. A happy housewife of the 1960s enjoying the fruits of engineering. 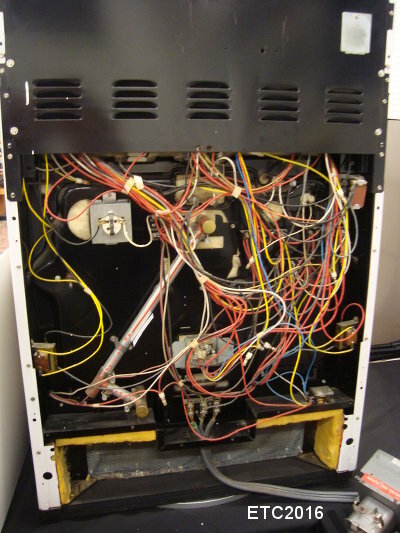 The back of the 915 MHz oven model from the 1950s. The magnetron pokes into the oven cavity directly unlike modern ovens which use a waveguide to bounce waves into the cavity. The 1953 GE oven model. The microwave oven is on the bottom. There are also calrods in the oven under the turn-table. The Edison Tech Center begins phase two of testing on the new Universe of Instrumentation project. We will be monitoring use over the next month to see how people are using the program and formulate how to improve it in the future. In phase one of testing we published a few articles on Ammeters, Voltmeters, Oscilloscopes and other topics on our static site. We used our older long page format. In this current phase we broke content down into smaller chunks with a simple “previous” or “next” button so users can navigate through in the proper order. Our mission is to tell the balanced story of innovation, and so naturally we’d like if users would progress from the most primitive technologies up to more recent devices. Even if many of our users are already engineers familiar with how the older technologies work, we usually provide unique information on back stories and the human side of the early devices. In the end each user finds a way to have our pages work for them, whether that is a quick look up of a name of fact, or an hour session researching the complete history. 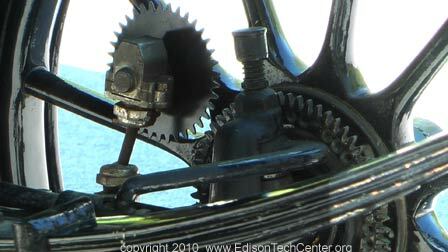 In the beginning of 2016 the Edison Tech Center launched a new site “EdisonTC.org” to host new program content. Many of our older program pages will continue to operate undisturbed in our former static site, but newer content well be published under our new framework. The effort to launch the new site is a response to the growing needs of our users who need a more responsive design for mobile and smaller screens. A great new feature however will be to streamline the publishing process and empower our volunteers to contribute more material. Our content contributors hold a passion for engineering and history and we want to make it easier for them to express themselves and share the lifetimes of knowledge they have worked hard for. In addition to internal improvements EdisonTC.org will allow users to interact and give useful comments under articles. We will continue to enforce a standard for comments similar to the BBC News website: There will be no offensive or personal attack language permitted and comments that are political or promote conspiracy theory or personality cults will be removed. Overall our goal is to engineers to help comment on topics and contribute towards other readers understanding of the topic, and possibly refer them to other good articles on the subject. We’ve started the new site with our latest project on engineering tools called “Universe of Instrumentation”. You can check out the new UI program here. Thanks for reading and don’t forget to connect with us on Facebook or subscribe to our YouTube channel.